Fly to Copenhagen and overnight at the Hilton Copenhagen Airport. There is a direct metro link from here that whizzes you into central Copenhagen in a mere 13 minutes, should you wish to sample some of the city’s delights. yourself with your surroundings there is a guided walk of the town. Return to the Hotel Arctic for a welcome dinner. We have left these days free for optional excursions. Activities will be dependent on ice and weather conditions, so an adaptable approach may be needed. Open water is expected until late November, but could last all winter. Snow is expected from early December. 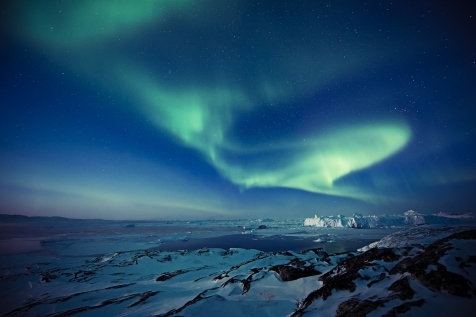 The Northern Lights are visible from September – March. Your local guide is on hand to assist should any pre-booked options need rescheduling. On your final night in Ilulissat there is a farewell dinner, and an opportunity to share your experiences with fellow guests. After breakfast, transfer to the airport for your return flight to Copenhagen (via Kangerlussuaq) and overnight once again at the Hilton Copenhagen Airport. Breakfast and choose your return flight home to suit any further shopping or sightseeing requirements. The 4* Hotel Arctic is located on a rocky headland with uninterrupted views over the town and the UNESCO World Heritage site of the Ilulissat Icefjord. Erik Bjerregaard has, over the years, extended the original property which now offers a wide choice of accommodation. The standard Puisi rooms with Philip Stark bathrooms, enjoy views of the town and harbour. Upgrade to the contemporary and elegant Umiaq deluxe rooms that enjoy Bang & Olufsen TV’s, original Greenlandic art work and guaranteed views of the sea and bergs. This property is full of surprises and delights and nowhere more so than in the kitchen. Restaurant Ulo is recognised as one of the best in the country. Café Ferdinand is a light and easy alternative offering tea/coffee, cake and what has to be the wildest ‘bar menu’ where even the bread incorporates seawater from the Icefjord. Hotel Arctic has hosted dignitaries and statesmen from the world over and you too are assured of a VIP experience. 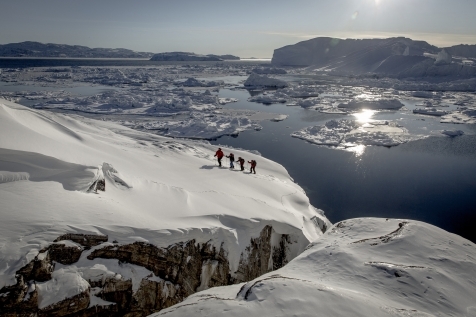 Take a leisurely walk along the UNESCO designated Ilulissat Icefjord to Sermermiut, where traces from three old Inuit cultures can be seen. Dependent on the season you may encounter a carpet of snow or wildflowers, berries and heather surrounding the boardwalk. The ever-present icebergs provide the backdrop. Refreshments included. Travel to the small settlement of Rodebay (Oqaitsut), which is only accessible by boat or dog sledge. 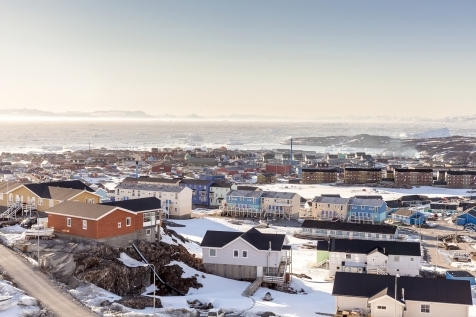 The settlement has just 40 inhabitants, who are entirely dependent on fishing and hunting, in contrast to life in Ilulissat. Enjoy lunch at a local restaurant and time to stroll around in the village. This excursion is operated by boat when there is open water. If the fjord is frozen then the village is only accessible by dog sledge – please see full day excursion by dog sledge option. Lunch included. Ilulissat is world famous for its icebergs and this cruise provides the perfect opportunity to get close to these gigantic monoliths sculptured by nature. It is a truly mesmerising experience. Excursion only operated when there is open water. 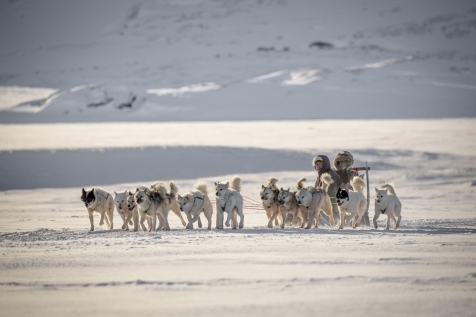 In a town where the dogs almost outnumber the human population, dog sledding is a way of life. It is a skill practiced by the Inuit for over 2,000 years, and more recently, any number of polar explorers. Leave the civilized world behind and enter an Arctic wonderland of low ridges and ice-covered fjords that have trapped gigantic icebergs in its frozen waters. The only sound is the runners of the sledge moving over the ice and the shouts of encouragement your driver makes to control his dogs. Excursion operated when there is snow. Rent of fur clothes included. 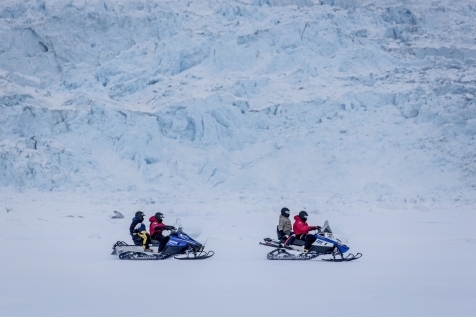 This guided tour follows the trail along the icefjord, also known as the blue trail. It starts from the quarry, passing through a dramatic cleft. After 1 hour ascending between walls covered with snow and thick ice, you reach a view point from where you can enjoy the panorama view of the “dog sledge highway”. After a small break to refresh and take some pictures, descend to the frozen lake and river bank. Continue along the rocky coast, passing Holms Bakke where, on 13th of January, the inhabitants of Ilulissat meet to celebrate the sun reappearing on the horizon after 6 weeks of absence. Lunch is at this incredible view point. You will then see Nakkaavik, the cliff where, in past times of famine, the women killed themselves with their children by jumping into the water. Finally the walk will stop at the abandoned settlement, Sermermiut. After a full day out in the beautiful nature we return to reach the old heliport at Ilulissat.